The ropes were there for a reason. That reason was to keep children from knocking this Zootopia statue over. 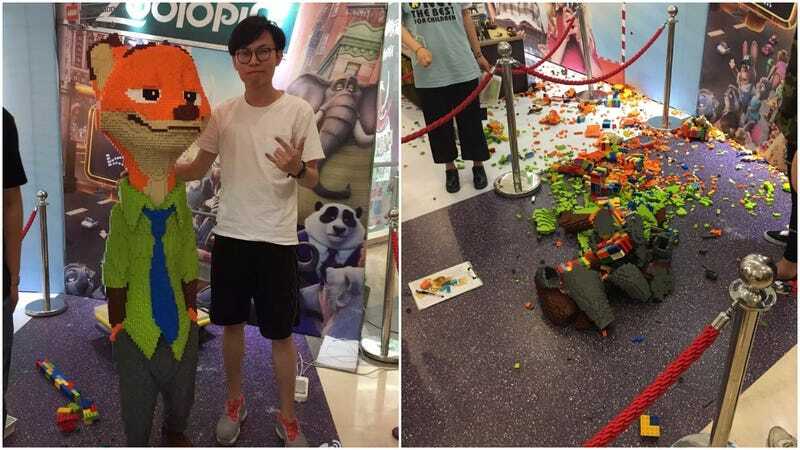 As NetEase and ShanghaiIst report, a builder named Zhao spent three days building a Nick Wilde from Zootopia statue, apparently using thousands of dollars worth of LEGO. The statue, ShanghaiIst states, went up at a shopping mall in Ningbo, China, and just an hour after it was shown on the first exhibition day, a child apparently climbed under the ropes and knocked the piece over. Zhao was as understanding as one could be, saying the child could have no idea how much time, effort and money went into the statue. He also said that the shopping mall employees were somewhat at fault. ShanghaiIst adds that the child’s parents apologized, and Zhao said he didn’t want any compensation for what happened.